Philip Coppens is one of the contributors to the TV series 'Ancient Aliens', and I can certainly see why his books are popular. He writes concisely and carefully, covering a broad range of subject matter with relaxed expertise. 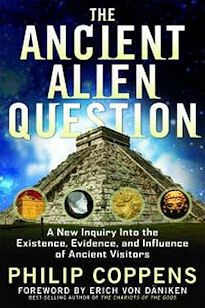 A long-time advocate of von Daniken's work, he takes a long, hard look at the Ancient Alien Question in this book, and comes up with some surprising conclusions. He begins with the startling possibility, advocated by a materials scientist, that many of the upper level blocks of the pyramids on the Giza plateau were manufactured, not quarried. After that eye-opener, he takes us through a potted history of ancient alien theorists, placing von Daniken's work in the context of a broader milieu. And that milieu certainly is broad, when you consider the conspiracy theories of Bramley and Icke. In Icke's worldview, the aliens have been here all along, and have played 'divide and conquer'. That seems to be true of the ancient alien question itself too, as Coppens then sets about debunking Zecharia Sitchin and Robert Temple. His points are well made about errors in their theories, which contained specific, refutable claims. But he extrapolates those errors to a pointed dismissal of their work. This is in sharp contrast to the benign way he views von Daniken's own errors, creating a double standard. It pains me that such deep divisions still exist in this field, but that seems to be the way it is. Much of the material in the book will be well known to people familiar with the field. Coppens is clearly well read, and distils the contents of his bookcase into this text with great style. He discussed the ancient Kings Lists, the longevity of the Biblical Patriarchs, and makes his way to the Pyramids once again for a more detailed look at Joseph Davidovits' geopolymers. Analysis of some of the pyramid blocks indicates that they were not quarried, but made using a materials technology that has only just emerged in our own science. Clearly, though, many blocks were indeed quarried, including the immense ones in Baalbek that are so puzzling. If a process for making stone-like concrete was known, then why bother quarrying a slab weighing a thousand tons? Coppens considers various ideas proposed by von Daniken, especially anomalous ancient monuments. His broad brushstrokes paint a global picture of technological prowess that defies expert opinion, especially in South America in the valley that Viracocha was said to travel through. He highlights the ancient Indian accounts of flying machines, weapons of mass destruction and, indeed, the aftermath of nuclear war thousands of years ago, that ushered in a Dark Age on the subcontinent. He enthuses about the aerodynamic properties of the 'Bogota aircraft', as reproduced by German engineers, which he considers best evidence for 'paleovisitology'. He considers every possible angle of the Dropa controversy in China. It is a point that is well made, and Coppens backs it up with a review of our exploration of the solar system, and how any indications for life out there have been quashed again and again. So far, so good. This is an excellent appraisal of the entire subject, covering a lot of ground. Yet, throughout the text there are hints that the author is not entirely at ease with the conclusion that flesh and blood gods came down to Earth and introduced civilisation to the human masses. When he mentions Roswell, he comes across as sceptical. Towards the end of the book he steers off in a different direction: Could it be that aliens didn't ever actually come here at all, but instead taught the ancients their remarkable technological and mathematical knowledge through channelling? I groaned inwardly at this point, but to be fair Coppens came up with some excellent supporting material. The pyramids aren't tombs (a fact that Egyptologists are seemingly in total denial about) but instead great monuments built to house the Pharoah's most important ritual, held during the Heb Sed festival in his 30th year as ruler. Makes a whole lot more sense when you look at the evidence. But just because the Pharoah followed the rituals laid down in the Pyramid Texts and tried to commune with the gods in a secret chamber in their purpose-built pyramid doesn't mean that they actually achieved it. Yes it does, says Coppens, who then advocates the ability of high-end psychoactive drugs to open the Doors of Perception and meet spiritual ETs. He points to the research conducted by Andrija Puharich et al to back up these claims. The benevolent spiritual masters are often described by shamans in similar terms to the Egyptian gods, it seems. And so on. Case made, then? The answer to the ancient alien question can be found by ingesting powerful hallucinogenic plants and mushrooms...? Well, I'm not too comfortable about that conclusion. It takes all of us in this field into a very dangerous place. That's not the point, I suspect Coppens would retort: The truth is the truth, no matter how unpalatable. Even so, the whole Ufology subject already suffers with a credibility issue without moving even further down the rabbit hole. If we proceed along Coppens' recommended route, it should be with great caution. I think that strikes the right note. This is a stirring and excellent book that should be read by everyone interested in the concept of 'ancient astronauts' (a term missing in the book, perhaps now out of favour?). It's conclusion is contentious, as are many of the analyses within its pages - my comments above attest to that. But, overall I'd highly recommend it. Subtitled "A New Inquiry into the Existence, Evidence and Influence of Ancient Visitors"